Automotive news and reviews…without the liberal bias! 2015 Volkswagen Golf, photographed in front of America’s gay liberal capitol. A not-so-subtle message, perhaps? The Golf is Volkswagen’s best-selling car in the socialist empire of Western Europe, along with a handful of other pissant nations whose governments think the path to success is to tax the daylights out of the rich and use their hard-earned money to pay for “social programs” for the unproductive. Here in the Occupied States of America, where people are still (for the moment at least) free to enjoy REAL cars, the Golf has been little more than a curiosity, enjoyed primarily a small group of Steve Jobs-worshiping liberal elites who are all too happy to pay too much money for too little car. But a curious thing has happened for 2015: The Volkswagen Golf has gotten nicer. And less expensive. And a lot more restrictive. Do you think perhaps King Hussein Obama got involved? Maybe he gave Volkswagen a little phone call and said “Guten tag, gentlemen, if you don’t want labor trouble at that Tennessee plant of yours, perhaps you’d better get my subjects into a more socialist frame of mind”? I’m sure liberals will say I’m a God-crazy gun-loving conspiracy theorist to propose such an idea, but remember that these are the same people who think Hellary might make a good President. Let’s do something that scares the living daylights out of socialist liberals, and look at the evidence. Ah, liberalism. Who needs to work when you can get all this silver FOR FREE? First, there’s the interior. The Golf has always had a dark, sober interior, one that encourages equality by reminding the driver that he will never rise above the social rank assigned to him by Der State. 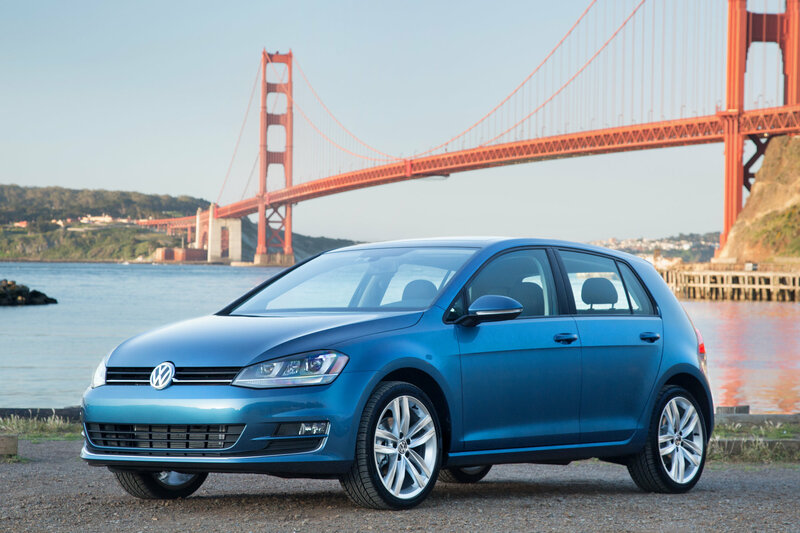 The new Golf is trimmed with brushed aluminum, even in the least-expensive models. What does brushed aluminum look like? Silver. What is silver? A metal that is valuable, but not too valuable. What is the message here? “Look, comrades! You don’t have to do anything, and you’ll always get second place!” It’s the kind of non-competetive, everyone-is-equal mentality that pervades sick Liberal thinking. What really scares me (and I use that term in the figurative sense; while the Liberal Agenda is frightening, Liberals are not) is the TDI diesel engine. Volkswagen has “improved” the TDI in accordance with Barack Hussein’s Communist agenda. Its new emission system requires diesel exhaust fluid (DEF), which the lefty liberals would like you to believe makes for cleaner emissions and reduces global warming, because Fargo, North Dakota is clearly right on the cusp of turning into a desert. Here’s the truth about DEF: Fauxbama’s Enviornmental Protection Agency made a rule saying that if a diesel car runs out of DEF, THE ENGINE WILL BE DISABLED. It simply will not start. DEF is only manufactured by only a handful of companies, and all it takes is one phone call from one of King Obama’s cronies to shut off the supply — and all of a sudden YOU cannot drive YOUR car which YOU bought with YOUR money. To conservatives like you and I, this is reason enough not to buy the TDI (as if we’d even consider this little German piece of scheiße), but pinko Eurotrash-wannabes probably LOVE the idea of Nobama dictating when and where they can drive. Wouldn’t we all be better off taking the bus? Lastly, there’s the GTI, a car which the Democrats have been trying (unsuccessfully) for thirty years to jam down our throats as a replacement for those nasty, environmentally-unfriendly American muscle cars. This year, Volkswagen has bumped up the horsepower to 220 — but ten of those horses are optional. That’s right, you have to pay extra for the most powerful version. Same for the limited slip differential. For those who aren’t mechanically-minded, the limited slip diff is the thing that keeps your pickup from getting stuck in snow and mud. When you have a tinny little crapbox that powers the wrong (front) set of wheels, you need a limited slip differential to get what little power there is to the pavement, otherwise the inside wheel loses traction and spins. Naturally, the Democratic White House would prefer you do not get all that power to the ground; they’d rather we drive nice and slow, like orderly Commu-bots. Last but not least, the new Golf is built in Nancy Pelosi’s favorite country, Mexico. Volkswagen is on thin ice with the Democrats; they dared to build a plant in the state of Tennesee, far away from the purview of Brobama’s fund-raisers in the UAW. (Needless to say, the good God-fearing people who work there do a great job; too bad they were given such a crappy car to build.) I guess VW’s management didn’t want to push things too far, so they offered to help the Resident-In-Chief fulfill his campaign promises by creating jobs… in Mexico. Encourages the Socialist philosophy of paying more and getting less. Has an interior that promotes the Liberal ideal of wealth for all with no work. Is powered by an engine that Obama can shut down at will. Encourages performance-oriented buyers to orient themselves towards less performance. Provides jobs for illegal Mexican immigrants in their own home country. And people say I’m nuts when I write about the automotive industry’s liberal agenda! This is just another useless attempt to lure the gullible American liberal public into “environmentally-friendly” Euro-socialist motoring. Unfortunately for Obama and his Politboro, we Conservatives aren’t as dumb as he looks. Don’t expect patriotic God-loving American patriots like me to start trading in our pickup trucks for this krappy Kraut kommuter kar any time soon. CopyRIGHT © 2014 Driving On The Right. All RIGHTs reserved. This entry was posted in Conservative car reviews by Driving On The Right. Bookmark the permalink. Yeah, DEF is just as harmful to the environment as a bit more emissions. It’s also corrosive and dangerous to the people who have to refill it. This review is hilarious! Please do more. “Provides jobs for illegal Mexican immigrants in their own home country.” LMFAO!! !